Formed in 2012, Bloody Hammers started as an exclusive studio project by Anders Manga. Manga, who already had an established industrial gothic solo career, has brought his gothic influences and merged them with heavier guitars. Writing at an incredible pace, Lovely Sort Of Death is already their fourth release in five years. Despite being viewed as a doom metal outfit, their songwriting is entrenched in Sisters Of Mercy and Joy Division blended with early Alice Cooper and Black Sabbath. They have a distinct sound and stand out from the plethora of bands playing depressive tuned down metal. 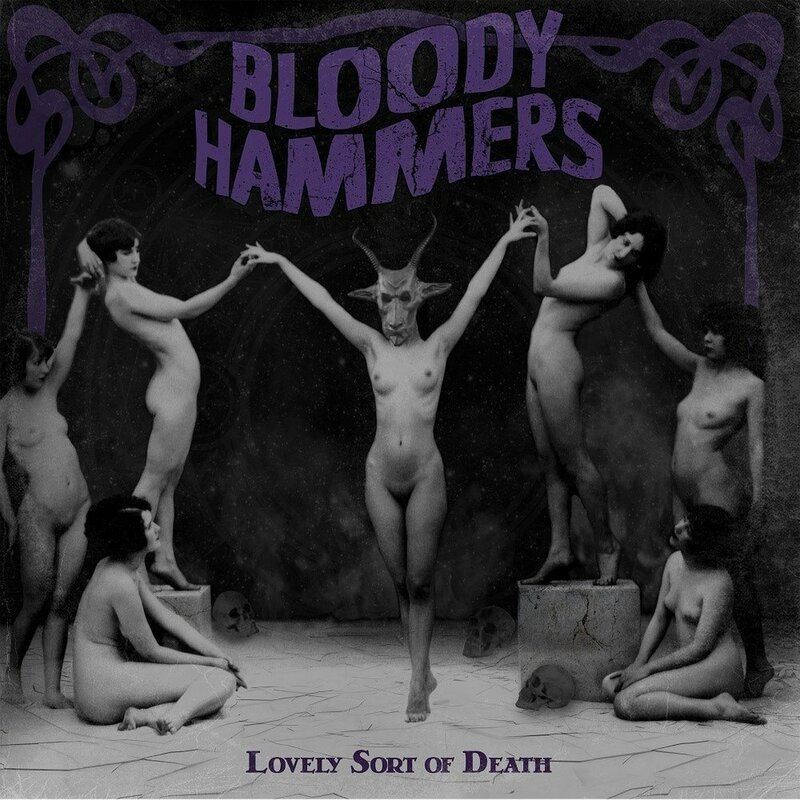 Lovely Sort Of Death finds Bloody Hammers embracing further electronic elements. More than ever, the songs are built around ambiance and dynamics. All of the instrumentation is performed by Manga except the keyboards, which are handled by his wife Devallia. The songwriting is spearheaded by simplicity as the song structures are punctuated by infectious melodies driven by Manga’s croon. Opener “Bloodletting On The Kiss” and “The Reaper Comes” are moved by driving bass lines with Manga almost whispering the melodies. The character of Manga’s voice is incredible as he can go from tender to forceful seamlessly. Both tracks take time to build with the peak escalating as the songs move on. Both “Messalina” and “Stoke The Fire” sound like the Mathias Lodmalm bands Sundown and later day Cemetary. In fact Manga’s voice is eerily similar to Lodmalm’s and their musical landscape is also mirrored. The album’s highlight is the exceptionally catchy “Infinite Gaze To The Sun.” Driving guitars and riffs increase the heaviness. The chorus is infectious and one is reminded of One Second-era Paradise Lost. Manga’s vocals are at his most comfortable here as the added gruffness is the perfect accompaniment to the thick guitars. “Ether” and “Astral Traveler” contains the most doom elements with the former being the heaviest song of their career. It is sludge induced and moves at a snail’s pace, while the latter moves at a quicker tempo and showcases some nice double bass drum work and once again is punctuated by another fantastic chorus. Lovely Sort Of Death finds Bloody Hammers growing as songwriters. The material is a great balance of gothic and metal. It is their darkest record, but also in a strange way their least metal. There are layers and a depth to the songwriting throughout the release to make it their most consistent record to date.